Pluto's moon Nix (left), shown here in enhanced color as imaged by the New Horizons Ralph instrument, has a reddish spot that has attracted the interest of mission scientists. The data were obtained on the morning of July 14, 2015, and received on the ground on July 18. At the time the observations were taken New Horizons was about 102,000 miles (165,000 km) from Nix. The image shows features as small as approximately 2 miles (3 kilometers) across on Nix, which is estimated to be 26 miles (42 kilometers) long and 22 miles (36 kilometers) wide. Pluto's small, irregularly shaped moon Hydra (right) is revealed in this black and white image taken from New Horizons' LORRI instrument on July 14, 2015 from a distance of about 143,000 miles (231,000 kilometers). Features as small as 0.7 miles (1.2 kilometers) are visible on Hydra, which measures 34 miles (55 kilometers) in length. 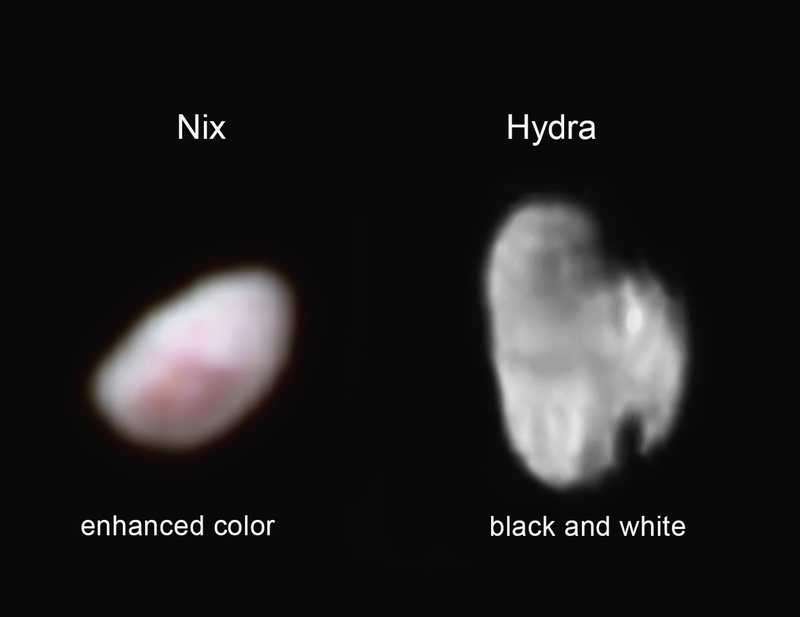 Nix and Hydra were both discovered in 2005 using Hubble Space Telescope data by a research team led by New Horizons project scientist Hal Weaver, Johns Hopkins University Applied Physics Laboratory, Laurel, Maryland. New Horizons' findings on the surface characteristics and other properties of Nix and Hydra will help scientists understand the origins and subsequent history of Pluto and its moons.